Welp, everybody wish me luck. This is going to be my first 5mi+ run on actual terrain (with wind) instead of a treadmill for probably about 3 years here. I'm looking forward to it, but I've got to say, the wind has got me a little bit scared. ;) Got to get ready for that 10k coming up, though! RMStudio is a page layout application to design templates for the ReportMill reporting tool. The same RMStudio page layout designer written for the desktop and available as a native Windows/MacOS application is now available in the browser! In trucking, an estimated 7.5 million IoT devices based primarily in 3G are still in use, but the clock is ticking on 3G. - #coolguides - A #nice #little #guide showing the #benefits of #running. Hey everyone, I’m #newhere. 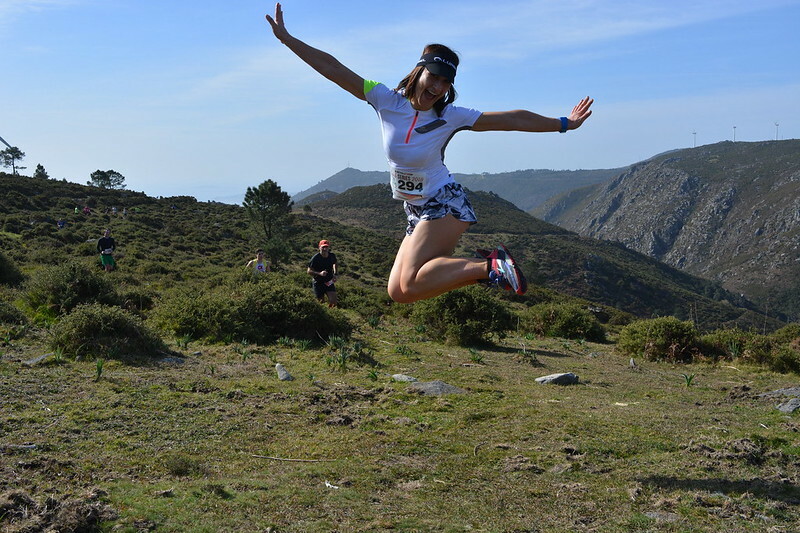 I’m interested in #photography, #running, #runningultra, #trailrunning, and #universities. Thanks for the invite, @Mark! A scheme to stealthily run video ads behind banner images drained users' batteries and data while they used popular Android apps. Julien is an independent developer who built and maintains one of the most popular audio apps in the Google Play store. With millions of downloads and hundreds of thousands of positive reviews, he’s obsessive about responding to user complaints and concerns. He often receives emails from users complaining that his app is draining their battery and using more data than expected. Usually, it’s because they set the app to download files when they’re not on Wi-Fi. 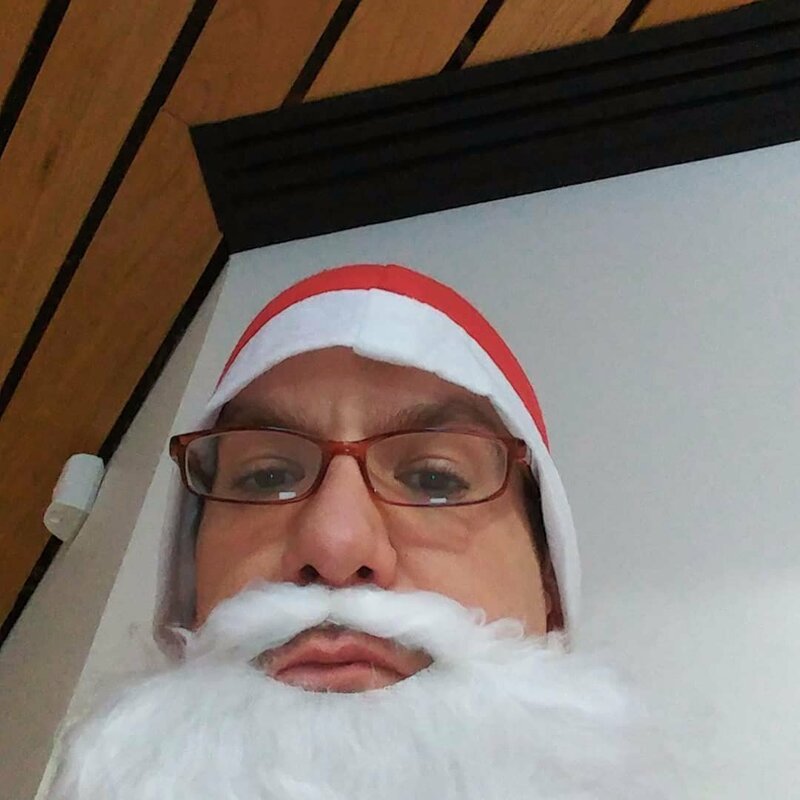 But sometimes it’s due to ad fraudsters taking advantage of his app to run hidden, data-hungry video ads behind the legitimate banners he sells to earn his living. Julienʼs app is one of several, including many using Twitterʼs MoPub ad platform, that saw its in-app ads hijacked in an ad fraud scheme uncovered by fraud detection firm Protected Media. The company’s findings, along with additional reporting and interviews by BuzzFeed News, and independent verification from an outside ad fraud lab, show that one of the players implicated in this scheme is Aniview, an Israeli company with offices in New York that runs a video ad technology platform. Aniview denies any involvement and instead says the platform and banner ads and code, which were created by one of its subsidiaries, were exploited by a malicious, unnamed third party. It’s just one of the many ways ad fraudsters siphon money out of the global digital advertising industry, which will see more than $20 billion stolen this year. This scheme in particular highlights once again how ad tech companies exploit insider access and technical knowledge to participate in ad fraud. Here’s how the scheme works. Julien sells a banner ad, which appears in the app and is visible to his users. Then, hidden from view behind that banner, fraudsters conceal autoplaying video ads that no human being actually sees, but which register as having been served and viewed. In this scenario, Julien gets paid for the small banner ad in his app that users see, but the fraudsters earn many times that amount by stuffing far more lucrative video ads behind the banner. Ultimately, it’s the brands whose ads were shown in hidden video players that lose money to those running the scheme. “Fraudsters are purchasing cheap in-app display inventory and are filling it with multiple video players behind innocuous fake branded display ads,” said Asaf Greiner, the CEO of Protected Media. This type of ad fraud is known in the industry as in-banner video ads, and has been documented in the past. Greiner’s team identified a new version of it last fall and said in total they’ve seen tens of millions of dollarsʼ worth of fraudulent video ads running per month as a result. The ad fraud lab run by DoubleVerify, a digital measurement company, identified the same in-banner video ad fraud scheme at the end of last year, according to Roy Rosenfeld, the company’s VP of product management. DoubleVerify saw at least 60 million ad calls being made for fraudulent video ads per month, though Rosenfeld noted that not all of those ad slots were filled. Aniview and its subsidiary, OutStream Media, were identified by Protected Media as being part of the scheme after the fraud detection firm gathered and analyzed video evidence, code, and other information during an investigation. Rosenfeld said DoubleVerify’s investigation identified that “the Aniview player was heavily driving” the fraudulent video ad activity. He said his team identified the same code and other materials as Protected Media had. Carmel, of Aniview, told BuzzFeed News that his company “does not knowingly engage in any fraudulent activity” and said his team has been trying to stop this activity on their platform since they were first contact by Protected Media last month. He acknowledged that OutStream Media, the company identified by Protected Media, is a subsidiary of Aniview. But he said it had ceased operations last summer and that Aniview is in the process of legally shutting it down. He said the ad fraud documented by Protected Media and DoubleVerify was done by bad actors using the Aniview video ad platform, as well as images and code created by OutStream Media, in an unauthorized way. “To be crystal clear, another customer on Aniview’s [self-serve] platform used this [video ad] player and is responsible for this activity and we took actions immediately to stop this activity,” he said. “We are fighting against bad activities, pushing and focus on clean and legit activities and should not be blamed or framed for bad use of our platform." Carmel could not say who this bad actor was or how they managed to gain access to content that was uploaded to an OutStream Media account on Aniview’s platform. He declined to identify the malicious actors, or to share any details about them. He also acknowledged removing the photos and names of people, including his cofounder, Tal Melenboim, from Aniview’s website after being contacted by BuzzFeed News. Two of the removed employees had leadership roles with OutStream Media in addition to their work at Aniview. Carmel, who previously cofounded the popular Jewish dating site Jdate, said they left the company to pursue other interests at the end of last year, and he neglected to remove them from the Aniview team page. Carmel was provided with a copy of the malicious code used to place the banner ads and hidden video players. In addition to using the Aniview platform and banner ads from OutStream Media’s account on it, this code included the URL shoval.tv as a tracking pixel to gather data on ad performance. Shoval.tv is a domain name owned by Aniview cofounder Tal Melenboim. In an email to BuzzFeed News, Melenboim denied any involvement. Carmel said the fraudsters must have copied the part of the code that included Shoval.tv from an earlier OutStream demo, and said Shoval.tv is commonly used as a tracking URL by Aniview. The inclusion of this code means that only a person with access to shoval.tv would be able to track the performance of the fraudulent ads carrying this pixel. This scheme illustrates one of the central challenges in reducing the massive, multibillion-dollar fraud problem in digital advertising: Nearly every player in the supply chain, except for the brands who spend money on ads, profits from fraudulent ad delivery. Even if they’re not involved in ad fraud, platforms such as ad networks and other intermediaries earn a share of the money spent on invalid ads. This creates a disincentive to stop fraud from taking place, according to Greiner. Protected Media provided BuzzFeed News with video documentation of invalid video ads running behind banners that were created by OutStream Media, Aniview’s subsidiary. These video ads were served using Aniview’s platform and the banner ads were hosted on Aniview’s website with an account in OutStream Media’s name. This demonstrates a direct link between OutStream Media and the banners that were placed in apps such as Julien’s. Protected Media also identified that the shoval.tv domain name owned by Aniview cofounder Tal Melenboim was used to track the performance of the fraudulent ads, adding yet another link to Aniview. After BuzzFeed News first contacted Aniview, the company removed the LinkedIn page for OutStream Media, and deleted people from the Aniview team page on its website. Two of the removed people were Melenboim, who had previously listed himself as the founder and CEO of OutStream Media on his LinkedIn, and his wife Mazal Melenboim, whose LinkedIn lists her as the head of media operations for Aniview and the head of operations for OutStream Media. Carmel said the Melenboims were removed from the company website at his direction after being contacted by BuzzFeed News, and said it was an oversight that they were still on the site. He offered to provide a letter from the company’s legal counsel to testify to the fact that the Melenboims had not worked at Aniview since the end of last year. He also said other employees were removed from the company’s team page at the same time. After BuzzFeed News emailed Carmel two links that showed the scheme was still active on his platform, the activity was quickly shut off. He said that was a result of his company being given the information necessary to shut it down. One of the links BuzzFeed News provided to Carmel went to a page at play.aniview.com/outstreammedia/ that hosted the banner ads used in the scheme. These banners were generic images for companies and products such as Coca-Cola, M&Mʼs, McDonald’s, and Disney. If a user clicked on them they were taken to the homepage of the Google Play Store, showing that they were not real ads. Carmel said these images belonged to OutStream Media and were created as test images when the company was operational last year. He said someone used these images without permission to execute the fraud. Ultimately what Carmel claims is that an unknown bad actor created an account on his platform, and then used banner ad images created by his subsidiary to execute the fraud scheme. He declined to share information about the bad actor’s account, citing legal concerns. He also couldn’t say exactly how this actor knew about banner ads uploaded to the account of OutStream Media — a company Carmel says was only briefly operational last year. He suggested one of the organizations OutStream had previously tried to pitch its services to was involved. “The demo page of Outstream units was public and as well have been sent to many potential customers (BTW, one of them was Buzzfeed),” he said in an email. Carmel did not provide contact information for the person at BuzzFeed he says received the OutStream pitch. He did provide screenshots of email templates that were sent to prospective clients in May of last year that included a link to a demo. Carmel says the same bad actor must have copied the OutStream tracking code that included shoval.tv, the domain owned by Melenboim. This means the fraudsters were sophisticated enough to set up and manage the scheme, but would have left in a tracking pixel that prevents them from receiving performance data on their ads. Greiner of Protected Media said several ad tech companies engaged in or facilitated this form of fraud. Aniview was the one they gathered the most convincing evidence about. Others continue to run the scheme after being contacted by Protected Media, and in at least one case an executive from an involved company even complained about being called out. Just before going to class and running over it with my tire a had to take a photo of this fungus! See the best free to download photos, images, and wallpapers by Benjamin Lizardo on Unsplash. Onte a visita foi a **Portosín**, no [concello de Porto do Son], para subir a un dos montes que forman a península do _Barbanza_ e que tantas veces visitamos. Saíndo do porto da vila fomos un par de quilómetros ao longo do mar, incluso por _dentro_ do mar, cruzamos a estrada xeral e comezamos unha subida suave ata que no quilómetro 6,5 comezaba a subida empinada de verdade. Despois a tirarse para abaixo, por zonas con moita pedra solta, seguindo un rego con lousas esvaradías, e chegada directamente ao centro da vila e o porto. Sabes que chegas ao alto e debes deterte un momento a **desfrutar**, a ser consciente (mindfulness?) de onde estás e **da sorte que tes** de poder realizar esa actividade. No meu caso particular a carreira tiña previsto facela a _ritmo algo forte_ pois é bastante corta. A semana pasada fixen un bo adestramento longo ao xeito do corpo e esta **aproveitei a carreira** para facer un adestramento de **intensidade**. Con todo, saín atrás de todo e con xeito para non _atufarme_ de inicio e só despois de cruzar a estrada comecei a subir a intensidade un punto. No tramo con máis desnivel (do km 7 ao 9) case todo era de andar, pero púxenlle interese en dar boas zancadas e para aprender tamén a avanzar en esta situación. O terreo estaba complicado sobre todo cando subimos polo cauce dun regueiro seco con grandes pedras e lousas; había algún tramo de carballeira empinada co terreo algo enlamado onde se esbaraba e había que agarrarse coas mans ao que podías. Así chegabas ao alto e rápidamente para abaixo. Aquí foi onde tiven algo máis de dificultade, pois era moi empinada e rápida, pero tendo **forza e técnica** podíase correr. Lamentablemente carezo das dúas  polo que fun con xeitiño de non deixar un nocello ou os dentes nun croio. En realidade non era complicado baixar, só que se querías arriscar podías gañar moito tempo. A media ladeira voltanmos a seguir o cauce dun regueiro (este si con auga) e de súpeto xa estabas na vila e directos a meta. Pasámolo ben pois o día ameazaba choiva e bastante fresco, pero quedou unha mañán de sol con algunha nube e temperatura fresca pero agradable (fun con camiseta de tiras). Cheguei san a meta, non me pasei de voltas co esforzo nin afuciñei, así que qué máis pedir. As sensacións foron as previstas, non corrín máis porque **non hai máis**  Esta carreira veume ben, así podo distinguir (comparando co domingo pasado) os diferentes ritmos para estar un par de horas correndo ou para estar catro. Compartín viaxe con **Antón**, que tamén lle foi ben e chegamos case xuntos. Is the LDL response to saturated fat a sign of a healthy individual? 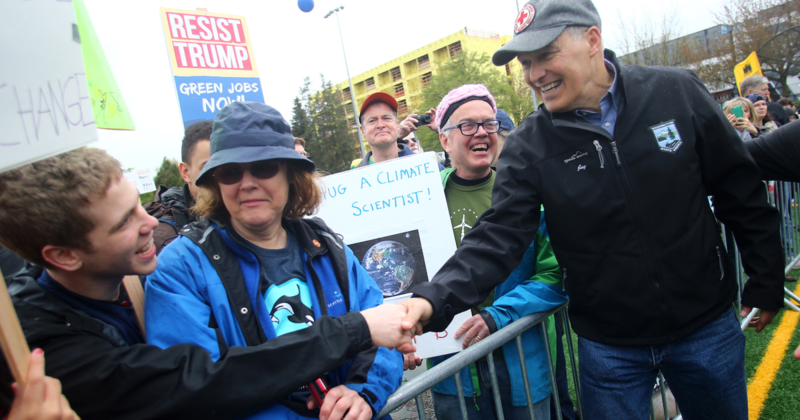 Inslee appears to be the first ever major party candidate to make climate change the central part of his platform. (Bloomberg Businessweek) -- The only place in San Francisco still pricing real estate like it’s the 1980s is the city assessor’s office. Its property tax system dates back to the dawn of the floppy disk. City employees appraising the market work with software that runs on a dead programming language and can’t be used with a mouse. Assessors are prone to make mistakes when using the vintage software because it can’t display all the basic information for a given property on one screen. The staffers have to open and exit several menus to input stuff as simple as addresses. To put it mildly, the setup “doesn’t reflect business needs now,” says the city’s assessor, Carmen Chu. San Francisco rarely conjures images of creaky, decades-old technology, but that’s what’s running a key swath of its government, as well as those of cities across the U.S. Politicians can often score relatively easy wins with constituents by borrowing money to pay for new roads and bridges, but the digital equivalents of such infrastructure projects generally don’t draw the same enthusiasm. “Modernizing technology is not a top issue that typically comes to mind when you talk to taxpayers and constituents on the street,” Chu says. It took her office almost four years to secure $36 million for updated assessors’ hardware and software that can, among other things, give priority to cases in which delays may prove costly. The design requirements are due to be finalized this summer. For local officials throughout the country, the shift from old-school servers to rented cloud storage has made it tougher than ever to fund upgrades. They can budget physical equipment as capital expenses, meaning they could issue bonds to pay for them. But cloud computing is a service, as the people selling it love to say, which means officials have to pay for it with operating funds—the same pool of money that goes toward addressing more tangible demands, such as parks and cops. The deliberate pace of government compounds the problem of strained resources, says Marc Pfeiffer, a former New Jersey official who now advises municipalities on managing technology as part of Rutgers University’s Bloustein Local Government Research Center. Businesses have started to see municipal woes as opportunities. Salesforce.com Inc., a maker of cloud-based applications that are being put to work on the assessor’s office project in the company’s hometown of San Francisco, has focused more on government solutions in the past five years. During an earnings call in August, co-Chief Executive Officer Keith Block called the public sector “one of our strongest verticals.” But cities and states are continuing to plow money into maintaining legacy systems, because they still work. Upgrades are difficult to start—and to finish—and attracting new skilled workers is expensive. The impetus for change is often public outcry over a crisis, such as the chaotic 2009 crash of a disco-era computer system regulating traffic signals in Montgomery County, Md., or the cyberattacks that brought Atlanta’s government to a standstill last March. And promises to improve are no guarantee of success: Minnesota spent about a decade and $100 million to replace its ancient vehicle-licensing and registration software, but the new version arrived with so many glitches in 2017 that Governor Tim Walz has asked for an additional $16 million to fix it. Of course, improvements cost money that constituents don’t always want to pay. “We’re dealing with an irrational public who wants greater and greater service delivery at the same time they want their taxes to be lower,” says Alan Shark, executive director of the Public Technology Institute, an association for municipal tech officials. In San Francisco the assessor uses a Cobol-based system called AS-400, whose welcome screen reads, “COPYRIGHT IBM CORP., 1980, 2009.” As the city tax rolls jumped 22 percent over two years, workers were struggling to keep track of the changes on their ancient systems. At one point they fell three years behind. It’s a “lot of manual work” just to perform basic functions, Chu says. Searches that should seem simple take much longer because of the system’s quirks. If a resident contacts the agency saying her house should have a different assessed value, a worker has to look up the block and identification number that’s technically taxed; there’s no way to filter by address. Also, all street numbers need to have four digits, so 301 Grove St. becomes 0301 Grove St. Another problem: The system doesn’t flag data entry mistakes, such as if a worker misidentified 301 Grove St. as 0031 Grove St. An employee giving a homeowner a tax exemption can cause the break to be revoked the next year by entering a single wrong digit on a different screen. It would take a complaint by the overcharged resident to bring the error to light. It’s taking what seems like forever to drag Chu’s office into the present century. After a bidding process, San Francisco awarded contracts in November to Sapient Corp. and Carahsoft Technology Corp., which provides the Salesforce software licenses. The new system, slated for completion in 2022, needs to address problems that can’t be solved in the App Store. Although tech companies like to fancy themselves altruists and world changers, Chu says they “have not really focused on solving the mundane problems of basic core government functions.” Private developers have created an app that lets people report poop on San Francisco streets. (It’s called Snapcrap. Yes, really.) Designing something to help the city pay for the cleanup? Different story. Issue: The system for storing and tracking crime reports is more than 20 years old, doesn’t comply with the national incident reporting system, and can’t link to other databases. Issue: Twelve different radio systems with portions dating to the 1970s prevent units from talking to one another. CourtsIssue: Case-tracking software to replace the Texas county’s outdated programs began development in 2012 but has faced repeated delays, leaving judges stuck with inefficient systems. Municipal courtIssue: A 1980s system for court records relies on typewriters. New software would ease the workload and reduce errors from having to repeatedly enter information. Issue: The nation’s second-biggest commuter railroad uses paper forms to procure its equipment and supplies. It wants a central, digital inventory. Streets departmentIssue: Control systems for most of the city’s 3,000 traffic signals date to the 1960s and make it harder for the department to manage congestion. Just over a year ago now, I finally opened the bakery I’d been dreaming of for years. It’s been a big change in my life, from spending all my time sat in front of a computer, to spending most of it making actual stuff. And stuff that makes people happy, at that. It’s been a huge change, but I can’t think of a single job change that’s ever made me as happy as this one. One of the big changes that came with going pro was that suddenly I was having to work out how much stuff I needed to mix to fill the orders I needed. On the face of it, this is really simple, just work out how much dough you need, then work out what quantities to mix to make that much dough. Easy. You can do it with a pencil and paper. Or, in traditional bakers’ fashion, by scrawling with your finger on a floured work bench. And that’s how I coped for a few weeks early on. But I kept making mistakes, which makes for an inconsistent product (bread is very forgiving, you have to work quite hard to make something that isn’t bread, but consistency matters). I needed to automate. I’d been on one of Bread Matters’ “Baking for a Living” courses and as part of the course materials had received a copy of a spreadsheet that could be used to go from a list of orders to a list of ingredients to mix alongside accurate costings and other useful bits and bobs. It was great and certainly opened my eyes to the possibilities for automation of this part of the job. And then I tried to add a new recipe. Spreadsheets aren’t my favourite computational model so maybe it was just my lack of experience with them, but adding a new recipe was like pulling teeth; lots of tedious copying, pasting and repetition of formulae. It just seemed wrong, especially as the underlying computations were so straightforward (ish). There had to be a better way. Of course, that’s not the full set of formulae, because it doesn’t tell you how to make ‘Seedy malt dough’, but that’s just another formula, which consists of flour, water, starter, salt and a multiseed ‘soaker’, where the starter and the soaker are the results of other formulae, which are (finally) made from basic ingredients. I did consider reaching for the object oriented hammer at this point, but thought that I might be able to do everything I needed without leaving SQL. It was relatively straightforward to move the shape of the calculations in the Bread Matters spreadsheet into my database schema, the only real sticking point being the recursive nature of the formulae, but it turns out that recursive queries are a thing in modern SQL, albeit a little tricky to get absolutely right first time. If you’re curious about the details of the schema, you can find it in my github repo for the bakery. So now, a few days before a bake, I’d setup my production_order table with the orders for the bake, and run a query on the production_list view to find out what I needed to mix when. And all was great. Well, sort of. I had to add a bit extra onto the quantities in the initial starter mix to allow for the bits that get stuck to the bowl and lost to the final dough, and it was all very well until I wanted to bake two days in a row (a bake is a two day process from mixing the starters on a Wednesday evening, through mixing, fermenting and shaping on Thursday to baking the resulting loaves at four on Friday morning). But, vitally, it was much, much easier to add and adjust formulae, and the limitations were no worse than the limitations of the spreadsheet. All was well. It’s the nature of business that you need to keep records. How much got baked? How much sold? Did we clean the floor? Were there any accidents? What sort? How do we prevent them next time? The list is endless. It all needs to be recorded, for both legal and pragmatic reasons. So I started a day book. This is just an .org file. Every day I come into the bakery, I run org-capture and I get a template for the day’s entry in the daybook, which I fill in as the day goes on. If that were all org-mode did to assist, it’d be awesome enough, but the queries I make are a little more complex than that, the current version of the database understands about dates and can cope with overlapping bakes, but all that makes the queries a little more complex. Org-mode helps with that too, because I can file away snippets of code in a ‘library of babel’ and just reference them from the daybook. And I can set arbitrary variables at any point in the hierarchy of the document. It won’t win any code beauty contests, but it does the job of setting a work_date variable for the day’s entry and running any code in the subtree as part of the capture process. The capture template has lines like #+call:mixes(), which call the stored code snippets, that reference the variable set in the current subtree and so make the query for the right day. This means that all I have to do to know what I should be doing when I get into the bakehouse is to run an org-capture and check the resulting entry in my daybook. Provided, that is, that I’ve added the appropriate rows to the database. At a certain point, it becomes easier to mix a ‘stiff starter’ in my mixer than it is to just mix the usual wet starter by hand. This breakpoint comes at around 3kg of flour. Right now, I manage this by looking at the mixes for my starters and, if it looks like a lot, changing the order to use 2-stage versions of the formulae and running the query again. I think it should be possible to automate this through a more sophisticated query, but I need to work that out. things get weird if a batch of dough would be more than I can mix in a single go. Right now there are other physical limitations that mean that I simply can’t make that much bread anyway, but once I get a few more bannetons and racks, this will become a much more pressing issue. Right now, I manage orders through Postico talking to the database, which is okay, but a little frustrating in places. An autocompleting environment for orders within emacs would be a much neater way to manage things. Computers are amazing. They are versatile tools even if you don’t know how to program them, because there’s almost always an app for what you want, or something close enough that you cant work around its infelicities. It’s quite remarkable the things that folks can do with their kit with no programming skill at all. But… learn to program, and a whole other vista of possibility opens up to you. With good programmable tooling you’re only really limited by your skill and understanding. Instead of accommodating yourself to your software, you can accommodate your software to you, and make the right functionality trade-offs for you. There’s a brilliant commercial piece of music looping sofware I use that could be massively more brilliant if there were a way of picking up the tempo automatically from the first recorded loop - it would free me from having to sing to a click and generally make the whole process easier. The developers have other (understandable) priorities, like porting the app to windows. And they’re not wrong to do so. There were folk clamoring for a windows version, and if a developer isn’t making money from a commercial application, then development will stop. I’m definitely not complaining, the feature is not so dramatically necessary that I’m prepared to spend the time learning how to do real time music programming in order to implement it, but if I want software to dance to my tune then doing it myself is the only way. So… choose tools that let you program them. I choose emacs and PostgreSQL, you might choose vim and SQLite or Atom and a NoSQL database, or you might just live in your Smalltalk image. Once you start to see your computing environment as truly soft and malleable, you can do amazing things, assisted by a computer that is truly yours. Escaping predators, digestion and other animal activities—including those of humans—require oxygen. But that essential ingredient is no longer so easy for marine life to obtain, several new studies reveal. In the past decade ocean oxygen levels have taken a dive—an alarming trend that is linked to climate change, says Andreas Oschlies, an oceanographer at the Helmholtz Center for Ocean Research Kiel in Germany, whose team tracks ocean oxygen levels worldwide. “We were surprised by the intensity of the changes we saw, how rapidly oxygen is going down in the ocean and how large the effects on marine ecosystems are,” he says. It is no surprise to scientists that warming oceans are losing oxygen, but the scale of the dip calls for urgent attention, Oschlies says. Oxygen levels in some tropical regions have dropped by a startling 40 percent in the last 50 years, some recent studies reveal. Levels have dropped more subtly elsewhere, with an average loss of 2 percent globally. A warming ocean loses oxygen for two reasons: First, the warmer a liquid becomes, the less gas it can hold. That is why carbonated beverages go flat faster when left in the sun, Oschlies says. Second, as polar sea ice melts, it forms a layer of buoyant water at the sea surface above colder, more saline waters. This process creates a sort of lid that can keep currents from mixing surface water down to deeper depths. And because all oxygen enters this habitat at the surface—either directly from the atmosphere or from surface-dwelling phytoplankton producing it during photosynthesis—less mixing means less of it at depth. Some coastal regions around the equator naturally are low-oxygen hotspots because they contain nutrient-rich waters where bacterial blooms consume oxygen as they break down dead marine life. But shifts in ecosystems elsewhere—including in the open ocean and around the poles—especially surprises and concerns Oschlies and others because these regions were not considered as vulnerable. Climate models projecting future change have also routinely underestimated the oxygen losses already observed around the world’s oceans, he and his colleagues reported in Nature last year—another reason why this trend calls for more attention, he says. 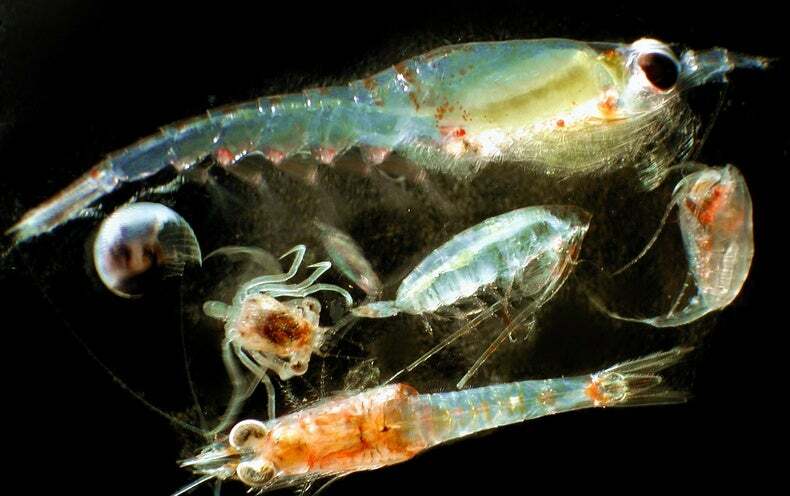 The effects of even very subtle dips in oxygen on where zooplankton—animals at the base of the food web—congregate in the water column were documented in a December 2018 Science Advances report. “They are very sensitive,” says study leader Karen Wishner, an oceanographer at the University of Rhode Island, even more so than she had expected. Some species swim to deeper, cooler water with more oxygen. “But at some point it doesn’t work for them to just go deeper,” she says, because it can be harder to find food or reproduce in lower-temperature waters. Many predators—including fishes, squids and whales—either eat zooplankton or eat fishes that eat zooplankton, so the ways zooplankton cope will have ramifications up the food web, she notes. Aside from food web disruptions, animals face various other physiological challenges as their bodies adjust to lower oxygen levels. Chinese shrimp flip their tails less vigorously to conserve energy in lower oxygen environments, becoming less agile as a result, a Marine and Freshwater Behavior and Physiology study reported last month. Also, some male fishes produce fewer and less motile sperm as oxygen levels decline—and the trend does not seem to bounce back in future generations when oxygen levels improve, researchers reported in Nature Communicationsin 2016. Basic sensory functions such as seeing and hearing might also suffer in an oxygen-depleted ocean, says Lillian McCormick, a doctoral student at the University of California, San Diego. Her preliminary results suggest even small drops in oxygen impair vision in some zooplankton. (This, too, happens in humans, with evidence of people traveling at high altitudes experiencing reduced night and color vision.) Many species of zooplankton rely on visual cues to migrate down the water column each morning to avoid predators, so sight loss could impede their ability to pick up on these light cues, she says. Some creatures, such as jellyfishes, are more tolerant of low oxygen than others are. But all animals will feel the impact of deoxygenation because they all have evolved their oxygen capacity for a reason, says Brad Seibel, an oceanographer at the University of South Florida who worked with Wishner on the recent zooplankton study. “Any drop in oxygen is going to impair survivability and performance,” he says. As oxygen-rich regions become scarcer, current fish habitats will also shrink and force economically important species—such as tuna, which globally generate an estimated $42 billion annually—into new ranges. In the northeastern tropical Atlantic researchers have found habitat for tuna as well as billfish fisheries shrank by 15 percent from 1960 to 2010 (pdf) due to oxygen loss. Coastline fisheries can also face the added pressure of agricultural runoff fertilizing algal blooms that consume copious oxygen as they decay—as has long been the case in the Gulf of Mexico near the mouth of the Mississippi River. These “dead zones” force some fishes to seek higher oxygen areas on the edges of their typical ranges. This can help fishermen find them because the fishes congregate in these condensed areas, but it also provides a false sense of abundance and will not be sustainable in the long-term, Seibel notes. To address the overall deoxygenation problem, Oschlies helped organize an international conference on the subject in Kiel last September. Attendees drafted an impromptu declaration called the Kiel Declaration on Ocean Deoxygenation to raise awareness among international governments, the United Nations and the public as well as to call for immediate action. They want governments and international groups to make more serious strides to slow climate change and cut back on the coastal runoff pollution that exacerbates oxygen decline. The researchers modeled the new declaration after the Monaco Declaration (pdf), which Oschlies thinks successfully helped raise international awareness around ocean acidification in 2008. One of disadvantages of regular #running is that it makes #alcohol less enjoyable somehow. I am not a heavy or regular drinker but I used to like having a drink or two a couple times per week. When I started to run regularly the idea of having a drink after work or during evening movie just lost its appeal. Sometimes thinking of alcohol is revolting even. It is weird, #cycling doesn't have same effect. 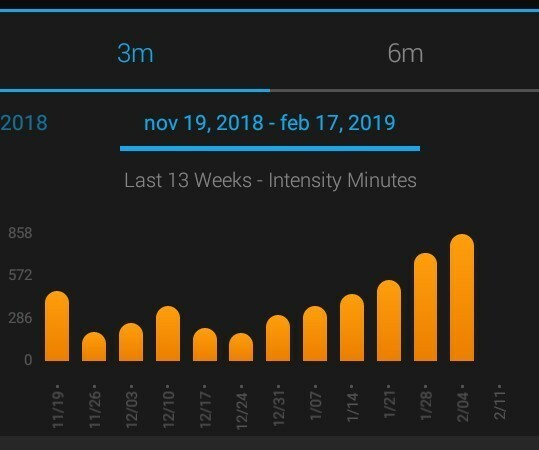 onde se ve a evolución nos últimos tres meses, sempre en aumento, dos "minutos de intensidade" por semana que contabilizou o garmin. Creo que por "intensidade" entende calquer "adestramento feito", algo que che faga subir o pulso, incluso correndo a ritmo MAF ou facendo rodillo na bici. pequeno artigo na bitácora sobre o intento e razóns para non mirar a clasificación das carreiras nas que participe. Men in Saudi Arabia have near-total control where women travel. INSIDER investigated the government's Absher website, which can help them do it. Shahad al-Mohaimeed got up at midnight to leave her hotel room overlooking the blue water of Trabzon, a Turkish vacation town on the Black Sea. Her family picked the hilly, historic port because it offered a seaside break, but within an Islamic society. Creeping barefoot out of the bedroom, al-Mohaimeed gathered her familyʼs credit cards, keys, passports, and, crucially, their phones. This would slow them down, she thought, when they tried to follow her. Her escape had taken a year of planning. Standing on the road outside the hotel she panicked at the silence. It was the first time in her life she had been outside on her own. It was also the first time since she was 10 that she had not woken up and put on a full-body covering, either a burqa or a niqab. "I was 17 and I was so scared, so, so, scared," she recalls. "I left at midnight, and the night was so dark. I was scared of my brother and my family." Until that moment, al-Mohaimeed had spent the entire 17 years of her life almost constantly in the physical presence of a male guardian, in accordance with the system enshrined in Saudi law. Her routine was mechanical: wake, school, home, sleep, repeat, she said. Donʼt talk to, or look at, any man you are not related to. The Quran deemed it indecent, she was told, and her father considered it worthy of a beating. Under her fatherʼs guardianship, she watched her teen brother spend a $1,600 monthly allowance as he pleased, while she begged for money to buy the most basic products. "I couldnʼt even buy anything for my period," she said. "It was my brother who paid for it, all the time, and he was younger than me." al-Mohaimeedʼs mother couldnʼt access money she earned at her job either, she said. She didnʼt have a bank account. Her husband took it because, in his view, she wasnʼt worthy of having her own property. Reflecting on her past life, al-Mohaimeed said bluntly: "Thatʼs bulls---." Speaking with INSIDER, al-Mohaimeed described frequent physical abuse from a father who she said regularly threatened to kill her. Infractions like being seen in the company of men who werenʼt family would be punished with having her wrists and ankles bound with rope. "My family are an abusive family," she said. "There is no support for the beaten," she said, "even when itʼs reported, police are always on the manʼs side." Women who get caught running away from the country are regularly never seen again. There are rumors that some have been killed — a prospect al-Mohaimeed saw as all too real. "When we decide to leave," she said, "we decide to put our lives on the line. Because if we donʼt succeed, our families are going to kill us. Itʼs shameful to have a daughter leave." INSIDER has not been able to contact al-Mohaimeedʼs relatives to ask them about her account. As well as physical restrictions and social pressure, al-Mohaimeed had to navigate a sophisticated online system to escape. Her fatherʼs phone — the one she stole that night in Trabzon — would have given him access to a Saudi government system called "Absher." Absher means "the preacher" in Arabic. It is the state-run system that contains the online expression of Saudi Arabiaʼs restrictive male-guardianship laws. The Absher system — little-discussed in Western media — contains a log of women in Saudi Arabia and the means to bar them from travel or catch them trying to leave without permission. Many of Absherʼs functions are benign and would not be out of place in any local or national government online portal. You can use it to pay parking fines or renew a driverʼs license. Vitally, Saudi men can also use this site to specify when and where women are allowed to fly out of the country and grant or revoke travel permission with a few clicks, rendering specific airports or destinations off-limits. Men can also enable an automatic SMS feature, which texts them when a woman uses her passport at a border crossing or airport check-in. The reason al-Mohaimeed waited for the vacation in Turkey is that she would have little chance of escaping from within Saudi Arabia, where borders are integrated with the Absher alert system. Any attempt to leave would be blocked as soon as her passport was checked at an airport. Even if she were to make it out, she would leave a digital trail making her easy to find. At least 1,000 women try to flee Saudi Arabia each year, and experts told INSIDER the text alerts had enabled many men to catch family members before they make it out. Getting around this system has become a critical step for women like al-Mohaimeed who try to run away from Saudi Arabia. INSIDER decided to investigate after a flood of interest in Saudi female refugees. The spike was prompted by 18-year-old Rahaf Mohammed, whose flight from the kingdom to Thailand became a viral phenomenon. We have made repeated attempts to contact the Saudi authorities for comment on the system, both directly to the Ministry of Interior and Ministry of Foreign Affairs, and via the Saudi embassies in London and Washington. At the time of publication, none had responded. Outside the hotel in Turkey, al-Mohaimeed hoped to find a taxi to take her to the airport, but there were none. So she walked to the nearby hospital to call one. She would board a flight to Australia, she hoped — or anywhere but Saudi Arabia. "I have four hours to leave Turkey before they wake up," she remembers thinking. Once she was inside a taxi, it took 20 minutes to reach the local airport, an airstrip offering mostly domestic Turkish flights. Only at the check-in area did she realize there were no departures until 8 a.m. It would not be enough time. The Turkish border with Georgia was 113 miles away, via a scenic highway hugging the Black Sea. The former Soviet state, which does not require a visa for Saudi citizens, was the only option she had left. She found another taxi, paid for the ride, and a couple of hours later was handing over her passport to the police at the border, and hoping. Border guards looked from her face to the passport, and then again. For 15 minutes they kept al-Mohaimeed waiting. "Oh my God, what could happen now?" she recalls thinking. "It was really a matter of life or death," she told INSIDER. "And when they let me in I was so surprised. I was going to ask them: Really?" al-Mohaimeed walked into the town from there, but she does not remember its name. She went to sleep locked in a public bathroom. From there she caught a ride to Tbilisi, the Georgian capital, and found a room in the city with somebody she met. Her plan was to ask for an Australian tourist visa, which can be applied for online. Meanwhile, she knew Saudi diplomatic staff members were looking for her, and Interpol had already come calling to her flatmate. INSIDER spoke with activists and Saudi refugees about Absher, the computer system that makes fleeing directly from Saudi Arabia so difficult. 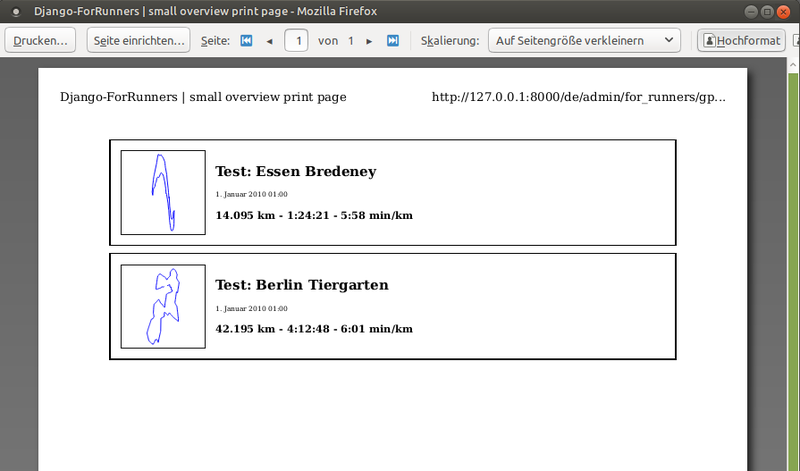 We also obtained screenshots from the site that show how it works. Absher is Arabic by default, but it can also be accessed in English. "Total Dependents Inside" refers to women (and children) who are inside Saudi Arabia. "Total Dependents Outside" refers to women outside Saudi Arabia, like those studying abroad at a university or on vacation. A second screenshot, from deeper inside the website, shows a screen for managing travel permissions. Men can specify numerous journeys women are allowed to take or specify a time period in which they can travel. \* A single journey anywhere. \* A single journey between two specific airports. \* Permission to travel until the passport expires (a maximum of five years). Before Absher, Saudi women needed a paper consent form with a guardianʼs signature, known as a "yellow slip," to pass through customs. Hereʼs a screenshot of the passport section on Absher that shows the travel log of a registered passport. The alert system is one of the main reasons women trying to flee Saudi Arabia get caught, because it tips their guardians off while they can still be apprehended, according to Dr. Taleb al-Abdulmohsen, a Saudi refugee who fled to Germany. Adam Coogle, a Middle East researcher for Human Rights Watch, also told INSIDER about the SMS alerts and corroborated al-Abdulmohsenʼs story. When the messages were made compulsory in 2012, Saudis criticized them on social media. The Saudi author and journalist Badriya al-Bishr said: "The authorities are using technology to monitor women. This is technology used to serve backwardness in order to keep women imprisoned." Nonetheless, they continued. INSIDER located copies of several alerts sent by the Ministry of Interior, which were shared in 2012 when the system was still a novelty. They all display on phone screens as coming from MOIJawazat. MOI stands for Ministry of Interior, and Jawazat is the name of the Saudi passport and visa office. This one alerted a guardian that a Saudi businesswoman named Sarah al-Ayed had used her passport to leave Saudi Arabia by plane. It says: "Sarah number ##### departed from King Abdulaziz Airport on 12-11-2012." Sarahʼs guardian was also alerted to another journey she made later in November from the same airport. This message, sent to Hassan al-Hashemi about his wife Muna, says: "Muna left king AbdulAziz airport on 14-11-2012. Number ****3551." And this one, sent to a man named Khalid al-Shnanah says: "Exit permit for Sala number ***7698 expires 25-11-2012." This most likely refers to permission a guardian gave to a women to travel for a fixed amount of time. This string of four messages documents two women, called Danah and Fatima, both listed as dependents under a guardianʼs page on Absher, leaving and returning to Saudi Arabia from Bahrain over the King Fahad causeway bridge. In response to criticism posted on social media, the government made SMS alerts optional in 2014. Later that year officials claimed to have suspended them, but many believe the system still operates. Coogle, of Human Rights Watch, told INSIDER: "The text alerts are still happening and thatʼs why they find out so quickly" when women try to escape. Two other experts corroborated this. Everyone knows about Absher in Saudi Arabia, al-Abdulmohsen said, and young women are now using a common technique to try to escape. Saudi women steal their guardianʼs phone, reset the password, and get a new one in minutes, he said. 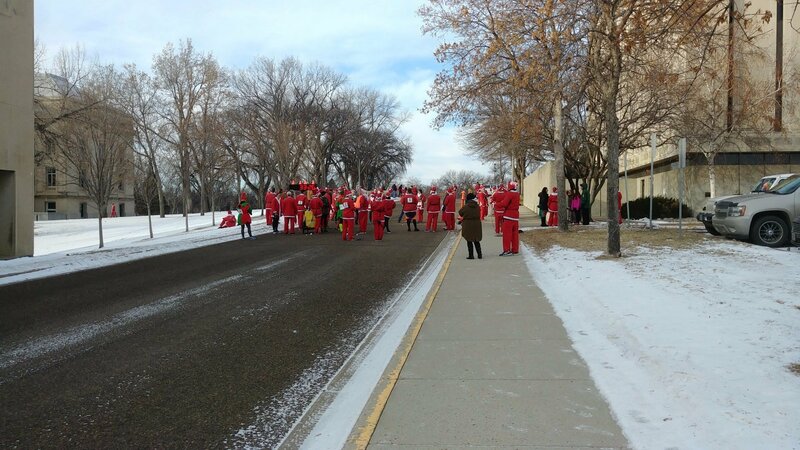 A few seconds later they have given themselves permission to leave. "But this is dangerous. If the guardian is thorough, he will regularly check the status of his dependents," he said. Shahad al-Mohaimeed, the Saudi refugee who spoke with INSIDER about her escape from Turkey, says she now gives advice to those planning to flee, particularly on getting travel permission and avoiding the MOIJawazat SMS alerts. "Steal the fatherʼs phone one night before they fly to make sure itʼs working," she said from her new home. "Sometimes it doesnʼt work, or the father has his phone with him all the time, so some girls canʼt." Another Saudi refugee, who used only the first name Salwa, told the BBC she used this technique to flee the kingdom. Yasmine Mohammed, a prominent womenʼs-rights commentator, told INSIDER some women changed the phone number linked to their guardianʼs Absher account so the alert SMS message would come to their phone instead. Even after navigating the technical side, the journey remains difficult and risky. Refugees, including Rahaf Mohammed, cite the case of Dina Ali Lasloom, who made it to the Philippines in April 2017 but was apprehended by her family and taken back. About a week after she was caught, Bloomberg reported she was being held in a Saudi correctional facility. Her current whereabouts are unknown. Despite cautionary tales like this, the support networks between women are strengthening, and escape attempts are on the rise, the experts told INSIDER. al-Abdulmohsen told INSIDER there were numerous forums and groups where women and girls shared tips for escaping. "There used to be no girls paying attention to asylum, now they all know about asylum, and they know about escape plans," he said. "Now they have more chance of being accepted abroad and have more knowledge of the process and evidence to get asylum." Yasmine Mohammed, the womenʼs-rights commentator, agrees. "Social media is showing women getting out, smiling, surviving, happy, encouraging other women to get out," she told INSIDER. "Itʼs falsifying the rhetoric Saudi women have been hearing all these years." More than 1,000 women flee Saudi Arabia each year, Mansour al-Askar of the Imam Muhammad ibn Saud University told The Economist in May 2017. Within Saudi Arabia, guardianship laws are also changing, but very slowly. As long ago as 2013, Saudi Arabia told the UN it would abolish the male-guardianship system and all discrimination against women. They have made some changes, according to Human Rights Watch. 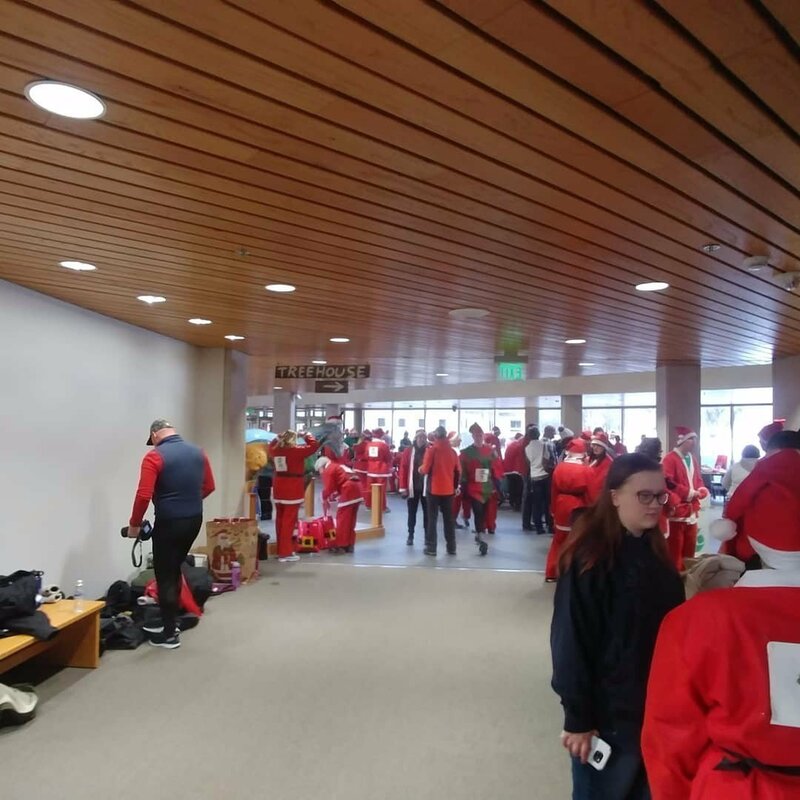 These include no longer requiring women to provide a guardianʼs permission to work or needing to bring a male relative to identify them in court. In April 2017, Crown Prince Mohammed bin Salman told all Saudi government agencies that women should not be blocked from getting government services because they donʼt have guardian consent, unless regulations require it. It has been two years since Shahad al-Mohaimeed left her hotel in Turkey and ran away from her family. In Tbilisi, al-Mohaimeed met another refugee, who had also fled from a strict Islamic country. Through this connection, she was put in touch with human-rights activists, who referred her to the UN. She was granted refugee status and, ultimately, a home in Sweden. She declined to give a precise location, citing safety concerns. Now, al-Mohaimeed goes to school every day and has a part-time job. She describes Sweden as "a good place" but says living without a family is hard. But she cannot go back. Even as a 12-year-old, al-Mohaimeed struggled to see the logic in believing God would punish her for exercising freedom of thought. "I didnʼt belong to this life," she said. "I hated it with all my heart." She worries about her friends back in Saudi Arabia, some of whom she says are detained in what Saudis know as "protection houses," the same sort of facility that reportedly now houses Dina Ali Lasloom. "Iʼm still sacrificing by living here in Sweden," she said. "But itʼs now who I am. I have seen a lot of things and itʼs what has made me. I can deal with anyone." Apple has now shut down Google’s ability to distribute its internal iOS apps, following a similar shutdown that was issued to Facebook earlier this week. 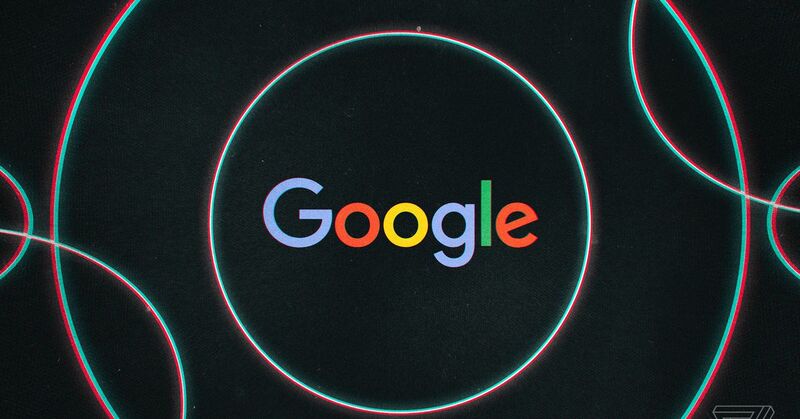 A person familiar with the situation tells The Verge that early versions of Google Maps, Hangouts, Gmail, and other pre-release beta apps have stopped working today, alongside employee-only apps like a Gbus app for transportation and Google’s internal cafe app. We’ve reached out to both Apple and Google to comment on the situation, but neither company responded by publish time. Apple’s move to block Google’s developer certificate comes just a day after Google disabled its Screenwise Meter app following press coverage. Google’s private app was designed to monitor how people use their iPhones, similar to Facebook’s research app. Google’s app also relied on Apple’s enterprise program, which enables the distribution of internal apps within a company. In an earlier statement over Facebook’s certificate removal, Apple did warn that “any developer using their enterprise certificates to distribute apps to consumers will have their certificates revoked.” Apple is clearly sticking to its rules and applying them equally to Facebook, Google, and likely many other companies that get caught breaking Apple’s rules in the future. Facebook’s internal iOS apps simply don’t launch anymore. Apple has shut down Facebook’s ability to distribute internal iOS apps, from early releases of the Facebook app to basic tools like a lunch menu. A person familiar with the situation tells The Verge that early versions of Facebook, Instagram, Messenger, and other pre-release “dogfood” (beta) apps have stopped working, as have other employee apps, like one for transportation. Facebook is treating this as a critical problem internally, we’re told, as the affected apps simply don’t launch on employees’ phones anymore. The shutdown comes in response to news that Facebook has been using Apple’s program for internal app distribution to track teenage customers with a “research” app. "“A clear breach of [Facebook’s] agreement with Apple”"
That app, revealed yesterday by TechCrunch, was distributed outside of the App Store using Apple’s enterprise program, which allows developers to use special certificates to install more powerful apps onto iPhones. Those apps are only supposed to be used by a company’s employees, however, and Facebook had been distributing its tracking app to customers. Facebook later said it would shut down the app. This poses a huge issue for Facebook. While Apple provides other tools a company can use to install apps internally, Apple’s enterprise program is the main solution for widely distributing internal apps and services. We’ve reached out to Facebook for comment. 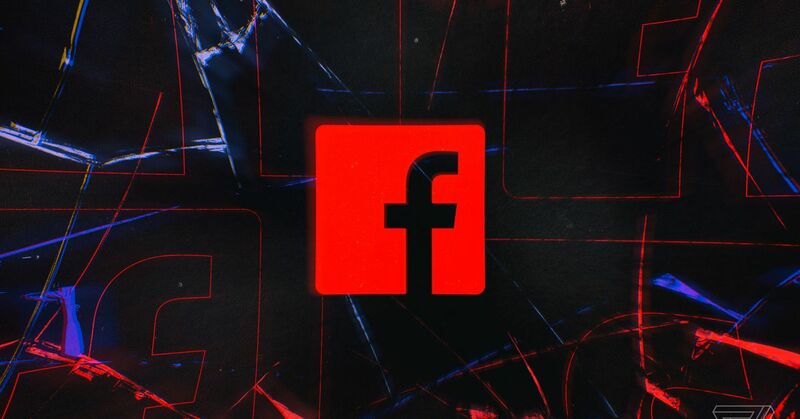 In a statement given to Recode, Apple said that Facebook was in “clear breach of their agreement with Apple.” Any developer that breaches that agreement, Apple said, has their distribution certificates revoked, “which is what we did in this case to protect our users and their data.” We’ve reached out to Apple for comment on shutting down Facebook’s other internal apps. Revoking a certificate not only stops apps from being distributed on iOS, but it also stops apps from working. And because internal apps by the same organization or developer may be connected to a single certificate, it can lead to immense headaches like the one Facebook now finds itself in where a multitude of internal apps have been shut down. 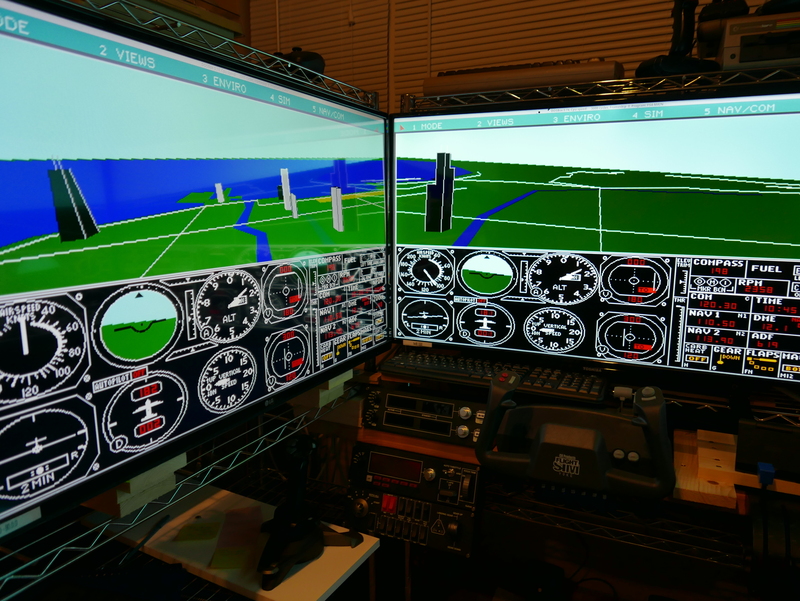 How I modified DOSBox and the original Microsoft Flight Simulator 4 from 1989 to run on my immersive multi-display flight simulator set up. Back in 1989, I was introduced to Microsoft Flight Simulator version 4. I thought it was incredible that I could fly around in a 3D environment, and this was something that got me interested in 3D graphics. However, I always had trouble flying the plane, because I only had a 14 inch CRT monitor, and you had a small field of view out the front of the plane. Since you couldnʼt see left or right, you were missing important flying cues, and it made flying much more difficult than in a real plane. Iʼve seen some people try to use joystick hats or head trackers, but those always require you to look forwards even if you are virtually looking another direction - it is not intuitive for your brain to understand. So at the time I realized this was a problem, and Iʼd seen commercial immersive flight simulators in books, but they were too expensive, so I had to wait a few decades for things to become a bit more affordable! 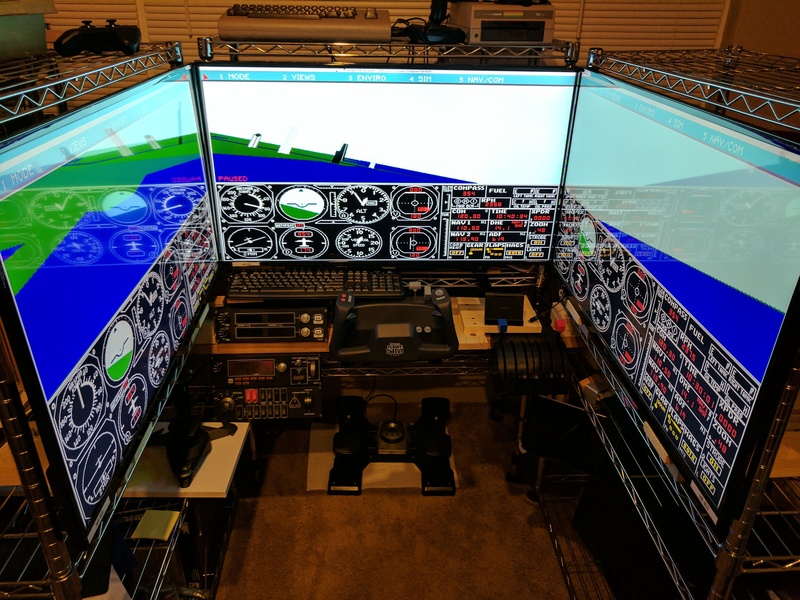 However, recently in 2017 I built my own immersive indoor flight simulator, using three large 42" televisions and X-Plane 11. 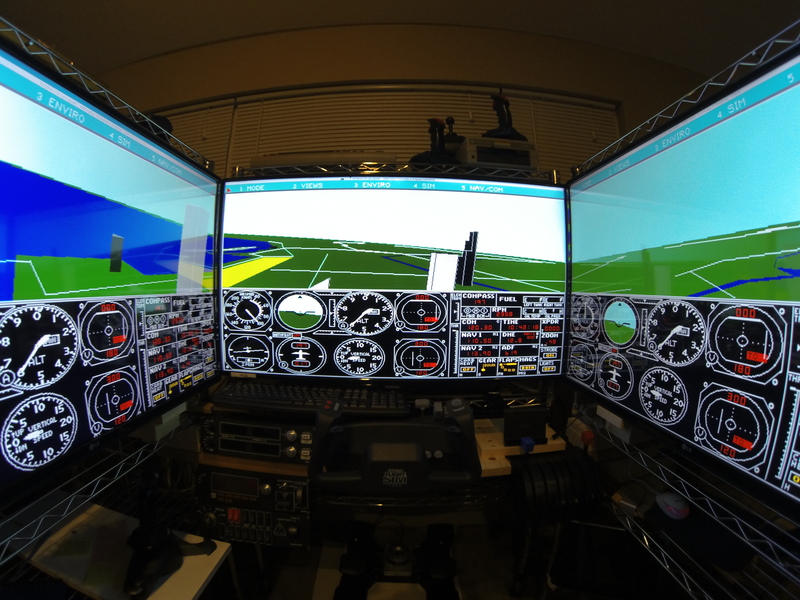 This provides a much more realistic experience, and it is finally the flight simulator I was always looking for. Iʼm a bit of a fan of emulators, so I used DOSBox on Linux to start up Microsoft Flight Simulator version 4 on a big monitor. It is amazing how low-res 640x350 is when displayed on a large 1920x1080 display, although you didnʼt notice it as much on a 14 inch CRT, which is smaller than many laptops these days. DOSBox supports emulating old analog PC joysticks, so I was able to configure FS4 to use my yoke and throttle. I always wanted to have one of those as a kid as well, and it worked great. While there wasnʼt much for graphics, it worked with a nice smooth frame rate, and it was pretty cool. 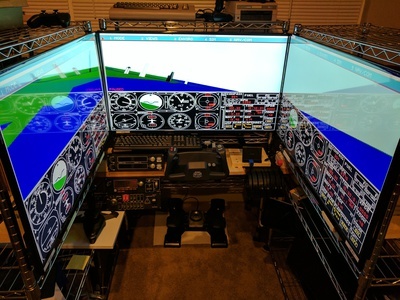 But then I started to think about how even better it would be to run FS4 on all three monitors, just like Iʼm doing with X-Plane now. In 1989, computers only supported a single small display, and definitely not three of them! The concept of using a cluster of machines was done in expensive commercial simulators even back then, but FS4 didnʼt support anything like that. FS4 supports the ability to do multiplayer over an RS-232 cable. However, there is no way to set the camera viewpoint to the remote aircraft, so that was not going to be a help in building a cluster. There was nothing else built into FS4 that could support what I wanted, and DOS machines back in 1989 didnʼt support networking or anything else either. All seemed hopeless with this ancient software. Since Iʼm running the whole thing within a DOSBox emulator, I now have access to networking and modern tools to try and achieve what I want however. DOS games were very simple in that they didnʼt use much of an operating system, and wrote everything directly to unprotected memory. I figured that the developer would have written the X Y Z and Heading Pitch Roll values to some kind of struct in a consistent location in memory. If I could work out the memory location of where the aircraft state is stored, I could intercept this with DOSBox, send UDP packets over the network to other DOSBox instances, and write to those same memory locations. When you dig around in the DOSBox source code, there is a simple 16mb array of 8-bit chars named MemBase in memory.cpp. That is the entire memory space of the DOS machine, and only the first megabyte is actually used. So I started up FS4, paused the game, and attached gdb to the live process and saved out a copy of the MemBase memory array. Then I entered slew mode, which allows you to reposition the aircraft at whatever coordinates and orientation that you want. Then you use gdb to again save the MemBase memory array. I noticed that FS4ʼs coordinate system seemed to have a maximum of 65535 so it was probably using 16-bit integers, and it didnʼt have support for floating point arithmetic since that was not common in 1989. So I changed the coordinates to values like 0, 1, and 65535, in the hope they would be more obvious in the memory dump as 0x00, 0x01, and 0xFF. I was also able to reload the dump file back into memory, and I could successfully move the viewpoint back to where it was. So in theory, this could work. I used the Linux cmp command to compare the binary dump files. You would be surprised how little actually changes between the dump files, and so I went through the differences to see if I could spot anything. I didnʼt find any of the 0x00, 0x01, or 0xFF changes that I was expecting, which seemed strange. After studying lots of diffs, I realized that FS4 must be using a different encoding scheme than just raw integers. I needed a new strategy. I decided to try just fuzzing over the memory locations that did change to see which one would have an effect. I modified DOSBox to add the ability to receive commands from standard input, and wrote 0x00 over those locations one-by-one with a delay between them. FS4 would crash and go crazy for some values, so I would restart it and keep looking for the desired effect. Eventually I found that the viewpoint would change drastically when I wrote to 0x28D0. Ahah! I had found a memory location that changed the viewpoint, but the encoding was super weird and didnʼt work the way I expected. Writing zeros moved the aircraft to +16384 instead of +0 or +32767. Given that there are exactly 18 bytes of memory from 0x28D0 that contain everything I need, it is pretty easy to send this to another machine. I created my own thread in DOSBox that uses memcpy() at a 10 msec interval to capture the state of this 18 bytes of memory. In theory, this is unsafe without synchronization against the main emulator thread, but it worked well enough for this experiment. I then take the 18 bytes of data, and transmit it as two UDP packets to the localhost network interface with different port numbers. I tried using broadcast packets, but it is not possible to have two processes on the same machine listening on the same port number. After implementing the receiver code in two separate DOSBox instances, I have now managed to do a one-way push of those 18 bytes from one process to two others. Now they are perfectly synchronized, and you see three FS4 instances all showing the same viewpoint! FS4 has keyboard shortcuts that allow you to take a viewpoint and make it look left or right. So you can manually set the left and right DOSBox instance running on each monitor to look in the correct direction. The remaining challenge is configuring the field of view, which can only be varied with keyboard presses, and not as a specific angle. It turns out that FS4 has the ability to do both large and fine changes to the field of view, but we need to work out what that is. The solution is to use slew mode and adjust the orientation of the aircraft so that Heading, Pitch, and Roll all have significant values - you can now see the horizon has large gaps in it across the monitor edges. But if you gradually apply the same zoom in/out controls to each monitor, one step at a time, you will eventually see the horizon become a straight line, and now you have the correct field of view programmed in. While it is possible to move the windows to the correct monitor and then use the keyboard to make all the changes to the viewpoint, this is very tedious and it is easy to make mistakes. I wrote a script using wmctrl and xdotool which allows me to automate the placement of the windows and then to send the necessary keystrokes. Now everything starts up as quickly and possible, and it is very reproducible every time I start things up. This video shows the synchronization taking place across the three monitors, and you can see that as the aircraft flies around, everything works just as well as it works on X-Plane 11 right now. This is the flight simulator I always wanted as a kid, although it is 28 years late! But it is so much fun to see software written 28 years ago that was never intended to be run this way, actually work on an immersive flight simulator like this! I made a number of changes to DOSBox to implement my own debugger so I could do the fuzzing more easily, and then to implement the UDP transmitter and receiver. I also added a new stretch mode that will take any DOSBox window and make it fit exactly the desired dimensions, even if it breaks the aspect ratio. While there are many forum postings claiming this should work, it never worked and the source code did not seem to not allow it either. So with my patches, now I can ensure there are no seams between the windows, and I can pick any resolution that I want. However, the default 640x350 used by FS4 most closely matches the aspect ratio of my 1920x1080 monitors, and the round instrument dials are still circular. You can use the 800x600 driver that came out in the early 1990s, but the aspect is not as nice. You can download my patched version of DOSBox here on github. There is a script apt-get-deps that will download all the necessary dependencies for an Ubuntu 16.04 machine. You will need to provide your own FS4 directory with binaries of the game. I still have my old disks from when I bought FS4 in 1989, but you can also find it on abandonware sites on the Internet as well. There is great web site PlanetMic where there are still fans playing the old FS4 on modern PCs, I hope they enjoy my project! It’s been a while since I last wrote about the Free and Open Source Software Audit project, FOSSA, so let me start with a quick recap that you can safely skip if you’re already familiar with the project. 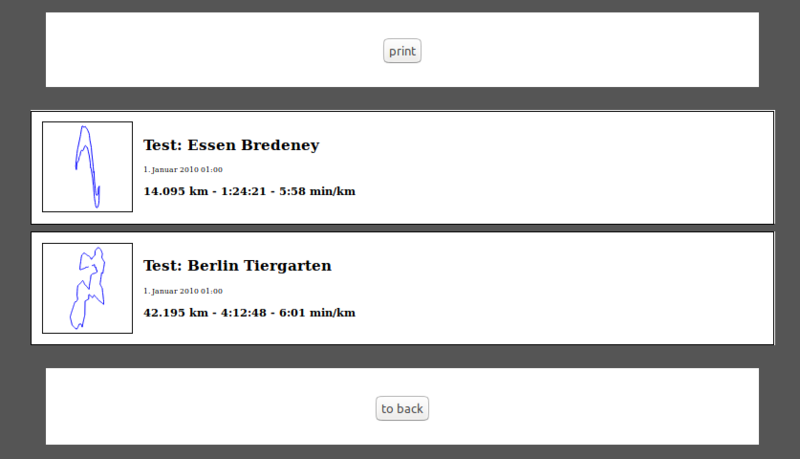 Well, yesterday was my last #run before the #race that I've entered for Saturday here. It's going to be the first one that I've run with any group of people since junior high/middle school. I'm not really too nervous about it, but I'm definitely hoping for a decent time. It's going to be a #5k; a little bit longer than this one, but not by a whole lot. 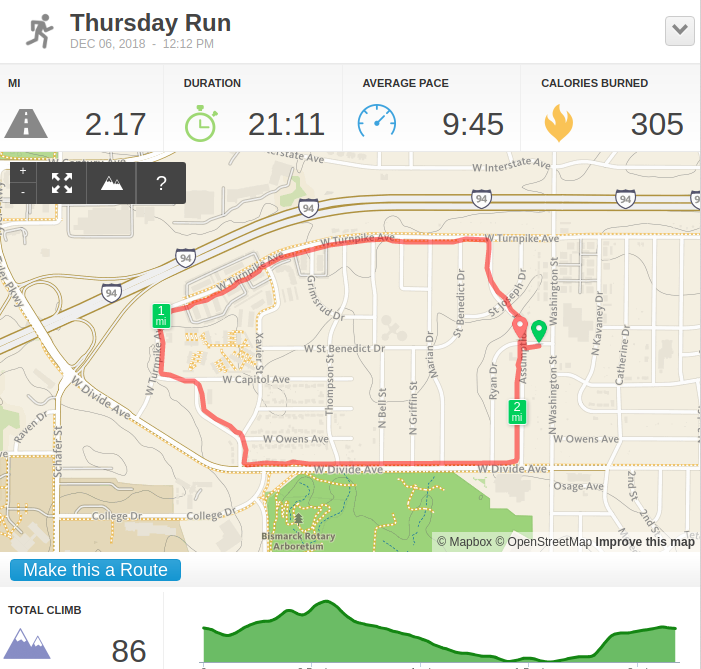 Pretty easy distance, though it's definitely been some time since I've run much longer than 3mi, due to the cold and everything. I've been hitting the #rowingMachine a lot instead, so I'm really hoping that my legs can keep up with the cardio that I've got going on here. My last couple of runs have been well below my usual average of time, but that's primarily because I've been having #asthma issues induced by the cold a lot. It'll be good to see how things turn out tomorrow, just need to remember to take the inhaler well before the race starts!